Visible Impact Leadership offers two types of Leadership Coaching programs: one-on-one executive coaching and group coaching programs. Both are available in person or via phone from anywhere around the world. We design our programs to meet your individual goals. We utilize a process that offers a distinctive combination of 360 assessments, self-reflection and practical exercises that will help you identify what is holding you back, allow you to leverage your strengths and make the move into your new level of responsibility a successful one. Just imagine what you could accomplish if you were able to partner with a coach who challenged you in new ways and shared tools to address your unique situation. One who offered a compelling combination of practical know how and a deep understanding of behavioral change to help you reach your goals. Heather brings to the table not just extensive training as a certified coach and facilitator but also nearly two decades of experience in the trenches as a leader. Clients rave about her ability to get to the core of the issues they are struggling with and help them make a sustainable change. Learn more about Heather’s experience. This program is perfect for you if you are taking on higher levels of responsibility in your new position or you’ve been recently promoted. You have experience as a leader and you want to have a positive impact yet you feel frustrated by the slow pace of change. You are starting to worry you won’t be able to live up to not only your boss’s expectations but your own as well. You want a coach who will listen, ask questions, challenge your assumptions, reframe situations and provide another perspective. You’re looking for a partner who can help you navigate this transition so you can make a visible impact. Contact us to find out more about our one-on-one executive coaching program and our unique 360 approach. This program is ideal for high potential leaders like you who have been identified as the next level of leadership for your organization. You are looking to build the skills and experience that will take you to the next level of success. During this 4-6 month program you will work together with a small group of emerging leaders on a specific leadership development area. You choose the area, along with input from your manager, and focus on a skill such as how to delegate more effectively, speak up and contribute your ideas more often, or influence others more successfully. The input from your manager and your commitment to change, combined with high level coaching from Heather, will ensure that your development as a leader will be quick, compelling and most importantly, visible. To find out more about our group coaching programs, click here. Do you have what it takes to be a high impact leader? 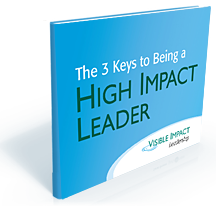 Grab this free report, The 3 Keys to Being a High Impact Leader, and discover how to unlock your potential and create the visible impact you desire. You will also receive my newsletter - free! Heather is an expert coach who knows how to quickly get to the source of underlying circumstances or patterns in one’s professional life and provide you with tools to help you navigate the situation with confidence. Heather is a great listener. She is able to pick up on key communication gaps and bring them to the forefront for exploring in a very productive manner.